Born from the genius minds of the Nolan brothers, Interstellar takes us on an epic adventure into unknown parts of our universe, on a quest to save humanity. The shear scale of this visual spectacular is magnificent, and even though my eyes were glued to the screen for almost three hours, I found myself wanting more. Unanswered questions left me wondering and imagining what the future of our world holds for our children. Set in the not too distant future, the earth is close to being uninhabitable. Mankind has regressed to an agrarian society and hence, considers farming the most important profession above all others. Armies have become unnecessary and society as we now know it, no longer exists. Cooper (Matthew McConaughey – The Wolf of Wall Street, Dallas Buyers Club, Sahara), a former NASA test pilot and engineer-turned-farmer, lives with his father-in-law, Donald (John Lithgow – This Is 40, New Year’s Eve, Leap Year); his son, Tom (Timothée Chalamet – Men, Women and Children, Clown, Homeland); and his daughter, Murph (Mackenzie Foy – The Conjuring, The Twilight Saga: Breaking Dawn) on their corn farm somewhere in the USA. Murph is convinced that their house is haunted by a ghost who is trying to communicate with her by pushing books off a huge bookshelf in her room. During one of the many and frequent dust storms that inundates everything, Murph accidentally leaves her bedroom window open. Cooper rushes to close it and discovers Murph’s ghost is actually an unknown form of intelligence attempting to communicate via a gravitational anomaly by shifting the dust to rest on the floor in a binary pattern. Translation of the code leads Cooper and Murph to a secret NASA installation which is under the leadership of Professor Brand (Michael Caine – Now You See Me, The Dark Knight Rises, Inception and many others in a career spanning over 120 movies since 1956), a former professor of Cooper. Cooper learns of NASA’s plan to save humanity which involves the colonizing of new worlds in another galaxy reached via a wormhole that has been discovered in the solar system orbiting Saturn. It’s origin is believed to be the act of extra-dimensional beings who are attempting to assist humanity in their only chance of survival. Plan A involves sending a team of space travellers in experimental spacecraft, Endurance, piloted by Cooper, through the wormhole following the Lazarus Mission – 12 manned capsules sent through the wormhole to survey the 12 potential planets and report back on their ability to harbour human life. Once a candidate planet is selected, humanity would follow. Plan B is similar, but instead of saving Earth’s population, a “population bomb” would restart the human race on mankind’s chosen new planet using thousands of fertilized embryos. After some deliberation, Cooper accepts the invitation to join the crew of the Endurance consisting of: Professor Brand’s daughter, Amelia (Anne Hathaway – Les Misérables, The Dark Knight Rises, One Day); physicist Romilly (David Gyasi – Cloud Atlas, The Dark Knight Rises); geographer Doyle (Wes Bentley – Things People Do, Cesar Chavez, The Hunger Games); and two multi-purpose robots, CASE (voice of Josh Stewart – Transcendence, The Dark Knight Rises, Law Abiding Citizen); and TARS (voice of Bill Irwin – Rachel Getting Married, Across the Universe, Hot Shots). His decision to go, breaks Murph’s heart who wants nothing less than to see her father go away for an unknown length of time into outer space. But he explains to her that the next time he sees her, they may very well be the same age due the effects of space-time continuum. However, this is no comfort to Murph who refuses to farewell Cooper, leaving him devastated. I love that when Cooper decides to go on the mission, he drives away from the house, the countdown to the launch is heard, and the adventure begins. Director, Christopher Nolan (The Dark Knight Rises, Inception, The Dark Knight) chooses not to put the audience through the training of the crew and all of the unnecessary build up to the launch, a decision I appreciated immensely. The addition of the two artificially intelligent (A.I.) robots is excellent and a welcome comic relief. Interstellar is another fantastic addition to the small collection of movies written and directed by Christopher Nolan. I am a big fan of his work. The killer soundtrack was produced by one of the world’s actual living geniuses and multi-award winning composer, Hans Zimmer. Nolan and Zimmer had worked together on The Dark Knight Rises and Inception, both of which were huge successes. The original score is perfect, and is sure to win some awards. The concepts of space-time have been touched on in several movies, but none more in depth and with such clarity than Interstellar. Watching Interstellar was not only an entertaining and absorbing experience, it was also a lesson in physics and a puzzling inclusion of the chicken-and-egg phenomenon. I can’t wait to see it again! 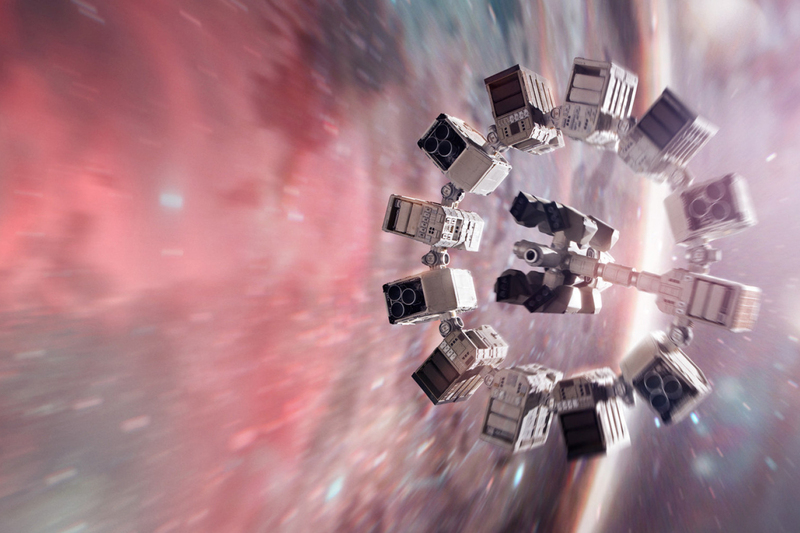 If you enjoy Interstellar, you may also enjoy: Gravity (2013), Sunshine (2007), Moon (2009), 2001: A Space Odyssey (1968) and 2010: The Year We Make Contact (1984). The Movie Lad rates this: Five out of a possible five gargantuan black holes.